The European qualification tournaments en route to the Women’s World Championship 2019 in Japan will be hosted by Slovakia, Switzerland, Greece and FYR Macedonia. The rights to organise were drawn at the EHF Office in Vienna on Tuesday for groups 2, 3 and 4. The teams of group 1 – Slovakia, Kosovo, Ukraine and Israel – had already agreed among themselves that Slovakia would be the host. 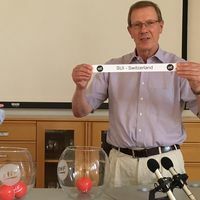 In group 2 – Switzerland, Faroe Islands, Lithuania and Finland – the first right went to Switzerland, the second to the Faroe Islands. In group 3 – Belarus, Italy, Portugal and Greece – the first right went to Greece, the second to Portugal. In group 4 – Turkey, FYR Macedonia, Iceland, Azerbaijan – the first right to FYR Macedonia, the second to Iceland and the third right to Turkey. The tournaments in groups 1, 2 and 4 will be played between 30 November and 2 December. The tournament in group 3 will be played betweem 23 and 25 November. The first ranked teams as well as the best second ranked team overall qualify for the play-offs which will be played in June next year. The playing dates for the Women's World Championship 2019 in Japan are 29 November to 15 December 2019.